Inspired to start growing your own? Whether you're itching to start your own veg patch or just looking to brighten up your garden with a fruit tree or two, a Marshalls discount code will get you great deals on a wide range of seeds of every variety. From broccoli, onions and parsnips to more exotic oriental vegetables, kiwi plants, fig trees and more, Marshalls coupons will help you plant and harvest your own food without spending a fortune. Known as the 'Vegetable and Fruit Company', Marshalls is dedicated to helping committed gardeners and complete newcomers alike to plant, grow and harvest their own fruit and vegetables. At Marshalls they aim to make growing your own easy and affordable, with a wide range of seeds, plants, trees, bushes and garden accessories to choose from. Everything they stock is of the highest quality, so you'll be giving your plants the very best start in life. Their potatoes and onions have won awards for their excellence, and their fruits are packed full of flavour. Always wanted to transform that muddy patch in your garden into a thriving veg patch to feed yourself and your family? Marshalls can help guide you through the process with expert advice available online and on the phone. Or perhaps you want to brighten up an outside space with beautiful flowers? There's a great selection of seeds and plants to choose from, including perennials, trees and shrubs, ornamental trees and more. Marshalls dedication to supplying the very best quality products has won them plenty of recognition in the industry, with the company winning Garden Catalogue Company of the Year for three times in succession. Not only that, but their exhibition of fruit and vegetables at RHS Hampton Court has won them a coveted Gold medal. Want to get shopping with Marshalls? 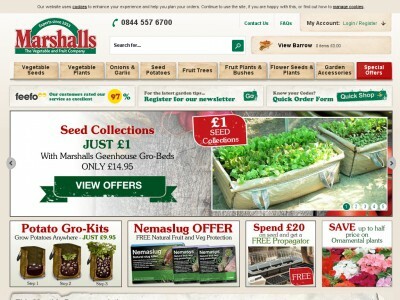 With a Marshalls discount code you can get great deals on their wide range of seeds, plants and garden accessories. So whether you're a keen gardener with an established patch or just getting started, a Marshalls voucher code will save you money while you shop. Award winning selection of garden products. Browse our website until you find a Marshalls discount code that suits you, then navigate to their website to begin shopping. Click on a product for more information, then click 'Add to barrow' to buy. Enter your Marshalls coupons where applicable. Want to find out more about growing your own fruit and vegetables with Marshalls? Why not pay a visit to the company's dedicated YouTube channel? You'll find lots of exclusive content including growing tips, video how-tos, recipe ideas and much more. You can also use this channel to find out more about saving money with a Marshalls code. If you've enjoyed shopping at Marshalls, you might also like to check out more great deals on garden products at stores like B&Q and Homebase. Or, if those aren't right for you, you'll find plenty more deals to browse in our Home and Garden section. Enter your Marshalls discount code where applicable. Enter your details and click 'Pay with card'. Standard UK delivery starts at £1.95 for seeds only, with slightly higher charges for bulkier items. Need to speak to the team at Marshalls? Whether you have a question about your order, want some expert advice on getting your garden going or simply want to find out how you could make big savings with a Marshalls voucher code, you can contact the Customer Services department by telephoning 0844 557 6700. Want to discover more from Marshalls? The company maintains a profile across all your favourite social media networks. Follow them for access to lots of interesting content including updates on fresh new fruit and vegetables, special offers, competitions and more. You can also use these pages to find out more about saving money with Marshalls promo codes. Don’t forget to check them regularly, as you can never be sure when a free Marshalls discount voucher might be waiting for you! Buy now online at www.marshalls-seeds.co.uk. I love to potter about in my garden, but the local garden centre is so expensive! Luckily, I found a Marshalls discount code online. At marshalls-seeds.co.uk you can find a fantastic range of seeds and plants that let you grow all your own fruit and vegetables at home – all available at a great rate with Marshalls coupons. I used my Marshalls voucher code to get a fantastic deal on some aubergine and radish seeds – and they'll soon be ready to harvest! So why not get a discount there and shop till you drop?